Tan Cheng Lock is probably the most famous Malaysian Chinese figure in Melaka. A public figure and a 5th generation Peranakan Chinese living in Heeren St. This street was renamed to the today's Jalan Tun Tan Cheng Lock after Malaya achieved independence. This street was also known as the "Millionaire's Row" where the wealthy used to vie with each other to build ornate house in the mid 19th and 20th century. Adjacent to Jonker Walk, we came across this Baba & Nyonya Heritage Museum at this street while searching for the Wanton Mee. We did not venture into the museum, but if time permits in future, I would like to explore on the Peranakan history and culture. This is one of the eateries recommended and one of our friends was around the area on the first day but couldn't find the eatery. I can now understand why. It's easily missed out coffee shop due to it's obscure-looking facade. It took us the second round on our car before I could really pin down on this coffee shop, taking in consideration that we have the full address. If you are a hygiene freak, then this coffee shop is probably not suitable for you. It has only a few tables, and probably not the most comfortable environment to take your meals. To be really honest, I nearly wanted to turn away when I found the coffeeshop as I was pretty disappointed at how run-down the place is. There were no other customers at the coffeeshop. But well, looks can be deceiving at times right? So how's the wanton mee? The noodle has the spongy feel, nice. There's a strong lard taste, the Malaysian taste associated with good food. Char Kuay Teow has this taste, and now, even wanton mee here. The wanton is well marinated and you can't taste the pork smell. I won't say it's fantastic, but it's definitely worth a try. We ordered the medium size one for RM4. Serving is still pretty small, but we are saving space for other food. There's an old newspaper article clipping on the wall, recommending the wanton mee in this stall, so probably was a pretty famous stall in the olden days? I remembered some 10 years ago, one of my Uni mates brought me to an old and dilapidated shophouse, (alright, it's abit exhilarating but you hardly find old shophouses in Singapore) somewhere around Jonkers area for very good Chendol. However, I couldn't really recall it exactly and I kind of lost contact with this Uni mate. I went to ask one of my friends who grew up in Melaka if such a eatery really exist and even went on insisting it was not the touristy Jonker 88. He knew what I was talking about and explain to me the directions. So, after passing the bridge of the Melaka river on the left, I walked down two streets on the left, and bingo, I found this shop! Imagine the excitement. It's a two storey shophouse, and more seats are available on the second storey. 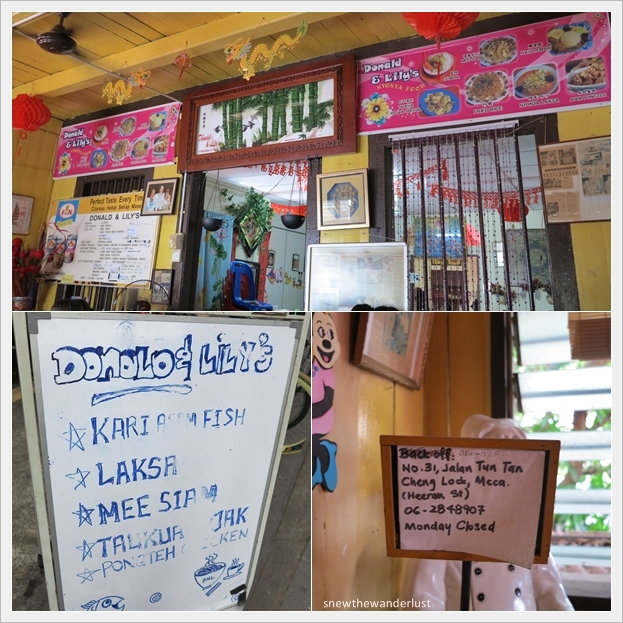 The cafe offers Nyonya Peranakan food like Ayam Pongteh, Mee Siam, Nyonya Laksa, and of course, Chendol. Anyway, the Chendol lives up to my expectation, better then Jonker 88. It would be perfect if the shave ice was blended a little finer. Looking around at what the other customers are having, we decided to try a bowl of Nyonya Laksa. OMG! This is really heaven. The coconut milk was very rich, and yes, it's sinful, but who cares. The ingredients for this laksa is also different, with strips of omelette and small fishballs, which you don't find it other Laksa. Till today, Papa Snew is still reminiscing this bowl of Nyonya Laksa. We will definitely go back to try this eatery again on our next trip to try other dishes. But wait, we saw a sign posted that it's going to move very soon, on the 16 Jun. Thanks! I've updated in the post.